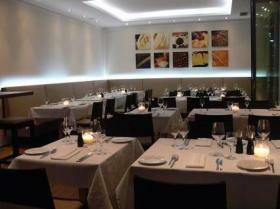 The Qube restaurant in Heidelberg offers excellent, fresh cuisine with regional ingredients. Whether excellent restaurant or design hotel: The Qube Hotel Heidelberg welcomes you! In a central location in the middle of beautiful Heidelberg, we want to spoil you with our friendly service and our personal atmosphere - your well-being is our claim! Business lunches, celebrations or just really good food? Visit us in the centre of Heidelberg: in our restaurant, in the bistro area, at the bar or in our cosy lounge. A table reservation or the booking of a menu/ offer is in the "Qube Hotel Heidelberg" via GlobalGuest always for free you as a guest!